LTC insurance, Medicare, Medicaid, Medigap... you may as well be speaking a foreign language. And that's just part of the lingo on financing long term care. How about trying to understand your choices for living -- assisted living, board and care facility, independent living, custodial care, multilevel facility, CCRC, RCFE, or SNF? You'll be able to get it all straight if you turn to this excellent resource published by NOLO Press (known for their understandable legal self-help books since 1971) and authored by Joseph Matthews. Now in its seventh edition, this book has long proven its value. You will find easy to understand definitions of what to choose in long term care, how to know what you need and ways to figure out how to pay for it. associated with long term care. You'll also find helpful state-by-state directories that will help you locate programs and specific information for your community. 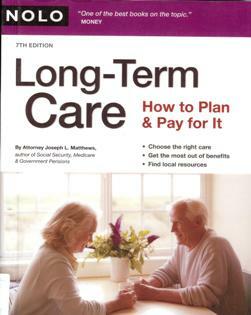 Get this book and start reading up on LTC and insurance now. Do it long before you think your aging parents are close to needing help. It will take you and your family that long to understand the options and make the necessary choices and decisions that could save you untold frustration and thousands of dollars later. Books recommended for the Sandwich Generation as you care for the generations before and after you.